A little look at our latest static caravan covers makeover and transformation. A day out at Primrose valley and a very happy customer. Owner and master tailor at Eeze Covers, Paul has been producing high quality, bespoke sofa slip covers for over 30 years. In this time, he has covered every shape, color and type of sofa. He is undaunted by difficult furniture and enjoys the challenge of covering awkward, complex or tricky types. 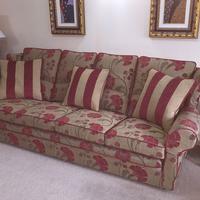 Customers often compliment his work on tailored loose covers looks like genuine reupholstery.